First settled in 1858 by David E. Harcourt of Scott County, Kentucky, the farm hasn't seen many changes through the ages. Neglected over the last two decades, it has been a non-stop project to bring this land back into working condition. Working with in close cooperation with the local Missouri Agriculture and Conservation Departments, the farm will again see profitable growing seasons and sensible land management techniques. We are still searching for any information regarding those who have lived here before. Our ultimate goal is to find a few family pictures that might have shown those individuals or the farm while it was still being actively worked and lived on. Not much is known at this time about the previous owners of this old farm. From it's beginings in 1858 by David Harcourt to it's last real owners, only sketchy dates and names fill these pages. Searches are made and inquires are posted, but for the most part, these people filled an important role in Northwest Missouri, only to be forgotten on an obituary page in some small local newspaper. David E. Harcourt 1858 - ?? From Scott County Kentucky. Thomas W. Higgins 1876 - ?? Not the "Major" T.W. Higgins of Hamilton, Missouri fame. 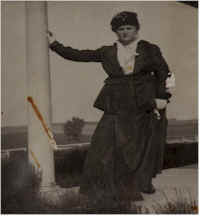 Matilda Higgins 1907 - ?? Pross T. Cross 1917 - ?? The county line road on the north edge of the farm is named in honor of this man. Pross Cross Rd. Pross Cross 1959 - ? ?